Android and iOS are still the two mobile operating systems to beat, but Microsoft has finally earned some bragging rights of its own when it comes to Windows Phone 8. According to market research firm IDC, over the past quarter, no other smartphone OS showed as much growth in shipments year-over-year as Windows Phone, giving Microsoft an even better grasp on third place in the market. During the second quarter of 2012, Microsoft moved a respectable 4.9 million devices, but really made waves these past three months by pushing 8.7 million phones. That 77.6 percent increase generated enough momentum to more than triple Apple's growth and surpass Android by a narrow margin. It also provided Windows Phone 8 even more distance between fourth place BlackBerry. Only Android was able to keep pace with the yearly growth Windows Phone 8 posted this past quarter, earning a 73.5 percent increase in shipments. More phones shipped clearly translated to an increased market presence, as both Android (79.3 percent) and Windows Phone (3.7 percent) outpaced numbers from earlier this year (75 percent and 3.2 percent, respectively). With Android and Windows Phone posting better numbers, somebody had to take the hit, and like the quarter before, Apple saw its stake in the overall marketplace dip from 17.3 percent to 13.2 percent in just a few months. Apple was already feeling the sting of diminishing returns, as during the second quarter last year, it held strong to a 16.6 percent share, and was only able to improve its shipments by 20 percent over 2012's numbers. "The iOS decline in the second quarter aligns with the cyclicality of iPhone," said Ramon Llamas, research manager with IDC's Mobile Phone team, in a statement. "Without a new product launch since the debut of the iPhone 5 nearly a year ago, Apple's market share was vulnerable to product launches from the competition. But with a new iPhone and revamped iOS coming out later this year, Apple is well-positioned to re-capture market share." Though 187.4 million Android phones were shipped during the last quarter, that success was spread out through multiple manufacturers. Samsung moved the lion's share with 73.3 million (39.9 percent), largely on the success of the Galaxy S4, but LG (12.1 million), Lenovo (11.4 million), Huawei (10.2 million), and ZTE (10.2 million) also posted double-digit shipments. By contrast, Nokia's 7.1 million Windows Phone 8 devices accounted for 81.6 percent of all shipments, giving the Finnish company's Lumia line a much needed boost of confidence at retail. "Nokia has clearly been the driving force behind the Windows Phone platform and we expect that to continue," Ryan Reith, program manager with IDC's Mobility Tracker programs, said in a statement. "However, as more and more vendors enter the smartphone market using the Android platform, we expect Windows Phone to become a more attractive differentiator in this very competitive market segment." If you were wondering just how rapidly BlackBerry was fading, the dip from 4.9 percent marketshare to a 2.9 percent stake should give you some indication. Oddly enough, BlackBerry's 2.9 percent is identical to where it was just last quarter, even though year-over-year, the Canadian manufacturer moved 11.7 percent less devices. Linux (0.8 percent) and Symbian (0.2 percent) have become virtual non-factors at this point in the game, and it's not all that shocking to see the shipments dwindling for either platform. 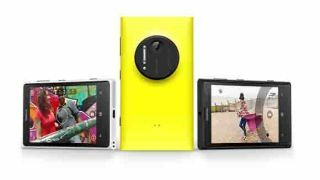 Given Nokia's proclivity for Windows Phone 8, it's a wonder there are even more Symbian devices still out there to be sold. Together, the three fledgling operating systems managed to account for just 9.1 million of the 236.4 million devices shipped last quarter. Even with BlackBerry continuing to scratch and claw its way to fourth place, the market is extremely top heavy, and the bottom is bound to give out at some point. It's just a matter of when. How do the top Android, iOS and Windows Phone 8 smartphones stack up against each other?